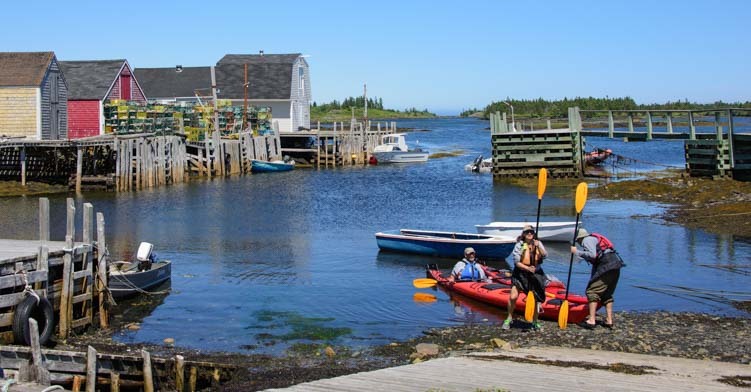 July 2015 – Nova Scotia’s south shore served up some wonderful scenery during our RV travels there, with the beautiful lighthouse at Peggy’s Cove lit up at sunset and the classic seaside village of Lunenburg. 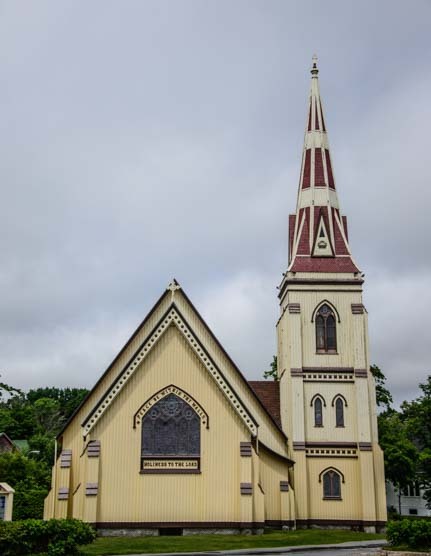 So, we decided to take a drive along the coast to the village of Mahone Bay and the tiny hamlet of Blue Rocks. 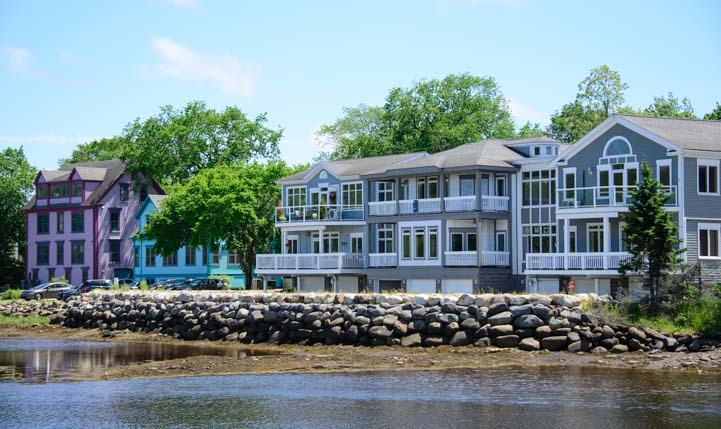 Mahone Bay is a small town that hugs the shore, and we walked along the waterfront taking in the pretty views. 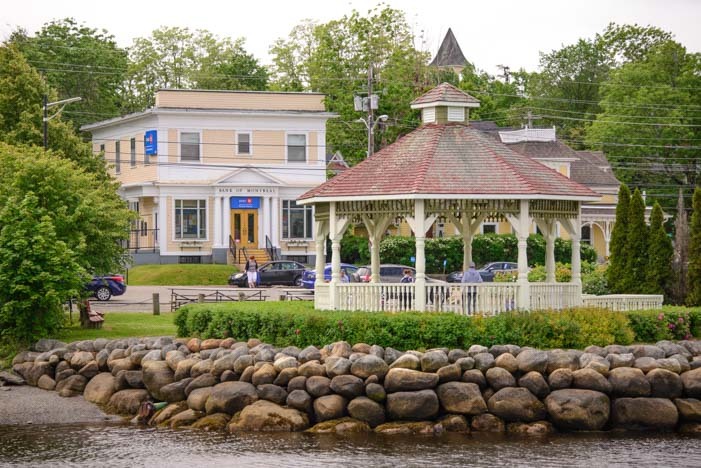 Mahone Bay is a tiny strip of a town with just a few buildings, but they were very attractive. There’s also a bandstand on the water’s edge. The distinctive church in the center of town. Mark spotted a shop called The Tea Brewery, and being an avid tea drinker, he headed on in. This place was filled with canisters of exotic teas, and he got into a lively conversation with the shopkeeper about tea leaves, tea types and how to brew the perfect cup. 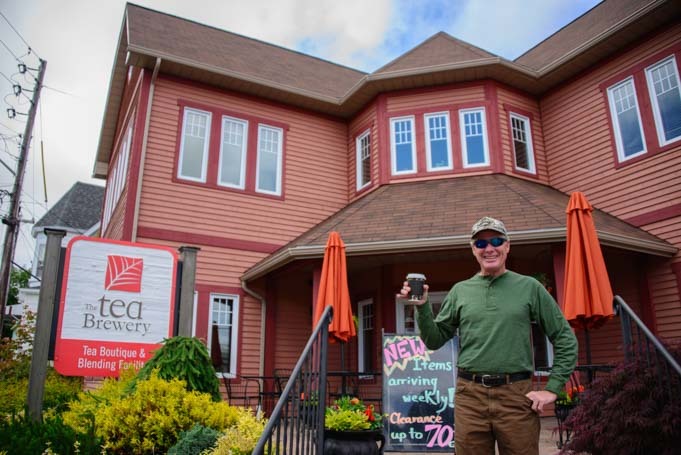 The Tea Brewery is dedicated to all things TEA! 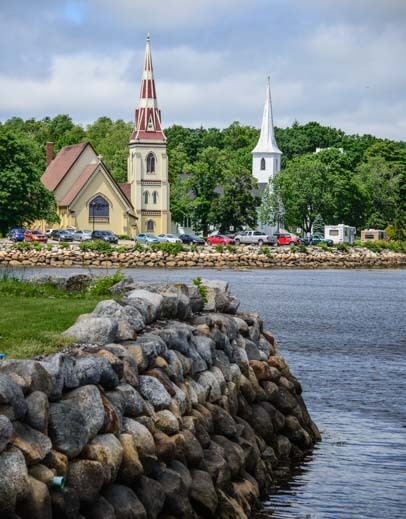 From Mahone Bay we took the coastal road past Lunenburg to Blue Rocks. 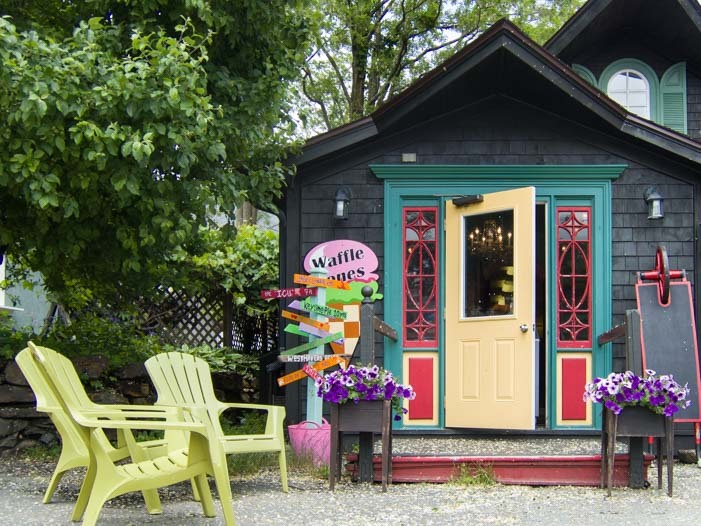 Summer is very short and very much treasured in this part of the world, and on the way we passed a place selling colorful lawn chairs that looked very inviting. They had enough seating for an outdoor summer concert! Ready for a summertime party! 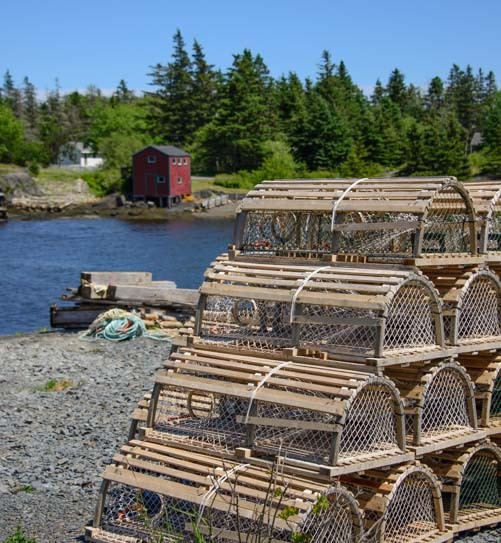 Our first glimpse of Blue Rocks was a tiny cove where there was a pile of beautiful new lobster traps that were built in the traditional style with rounded wooden tops, although this style seems to be very much in use in Nova Scotia today. A lobster boat was anchored in the small bay. We didn’t see anyone around except a few tourists like ourselves who were enjoying the scenery — and it was lovely. A cove in Blue Rocks. 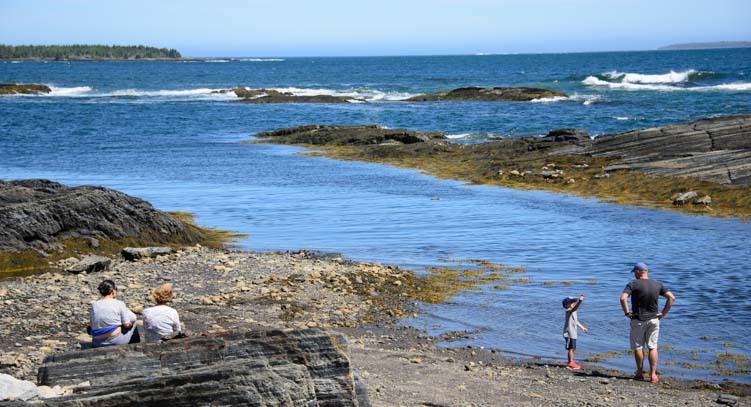 The cove opened up to a small rocky beach where a family was picnicking. We turned a corner and there was a small harbor where some people were coming in from a kayak ride. 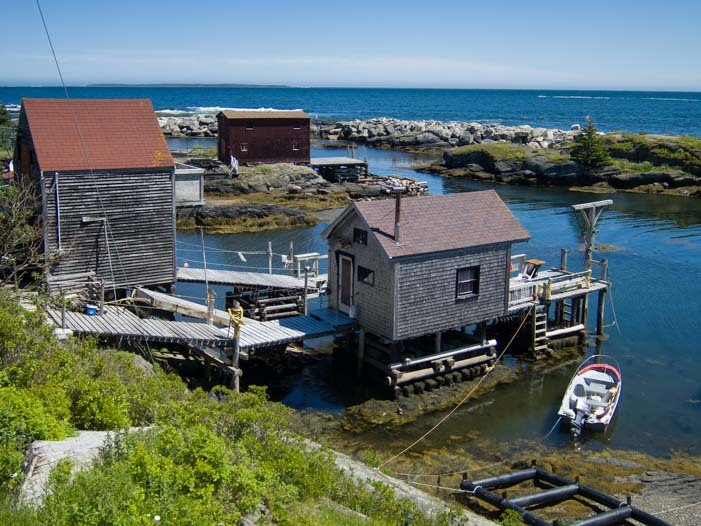 Blue Rocks, Nova Scotia, isn’t far from the big city of Halifax, but the serenity of this little cove made it seem worlds away. 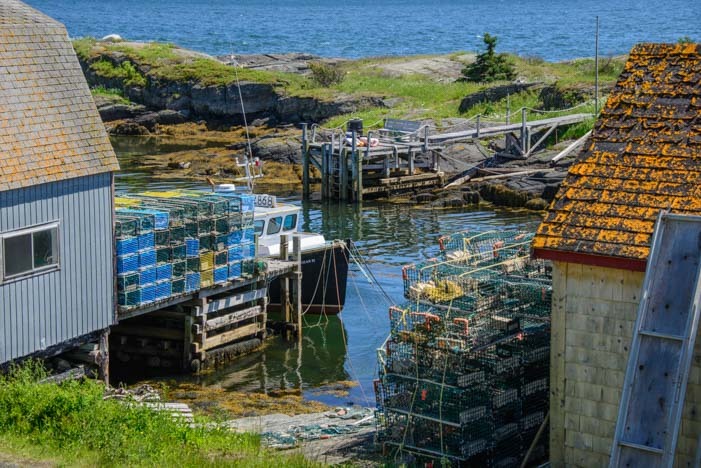 Lobstermen live a simpler life harvesting their catch from the sea, and they have been doing it pretty much the same way for generations. The fast pace of modern society doesn’t exist out here. 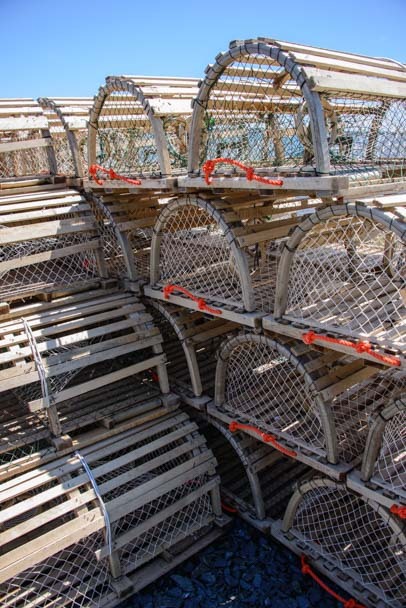 New lobster pots built in the traditional style ready for launch. 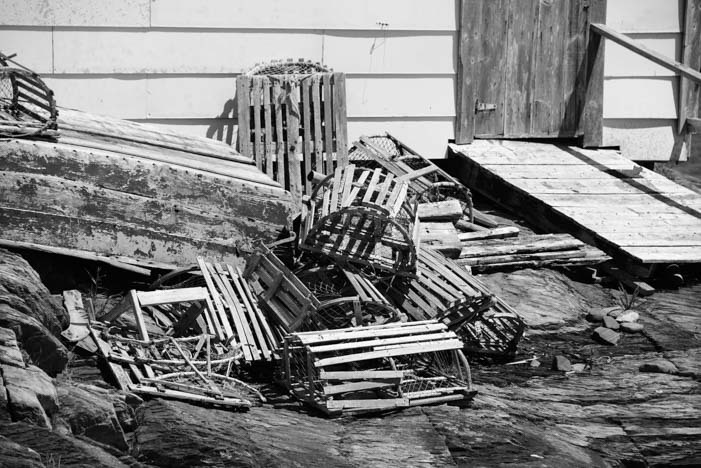 Old retired lobster pots that have served their time. We continued our drive along the shore and came to a really fun little ferry crossing. 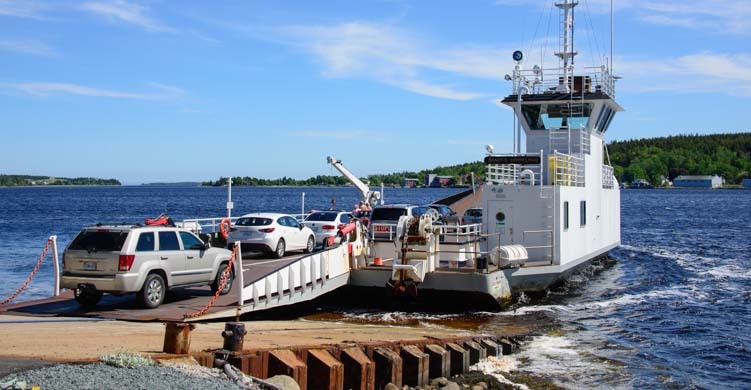 This is the LaHave – East LaHave Ferry that zips back and forth across a very short distance. 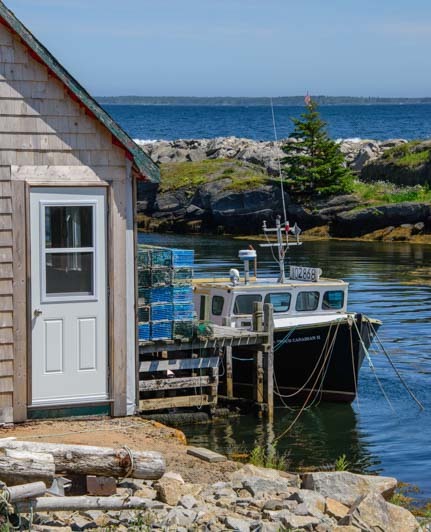 There are lots of little ferries like this down in these fingers of land and peninsulas on Nova Scotia’s south shore. 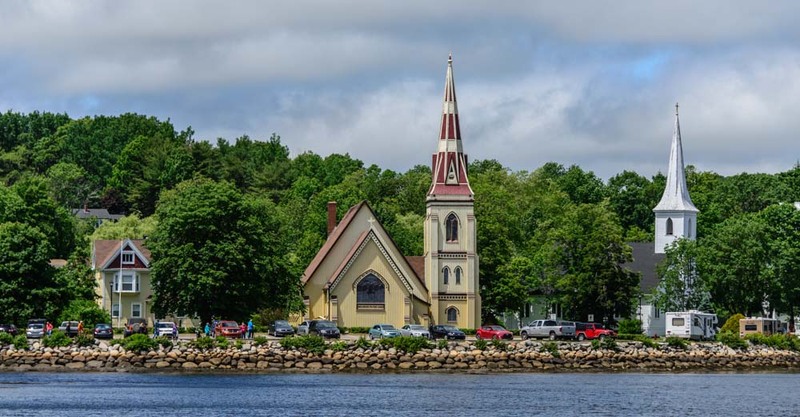 We didn’t take it, though, and instead turned north along the LaHave River. Next time! Cars board the 10 minute ferry from LaHave to East LaHave. Just a bit further up the coast, we passed St. Mark’s Place, a wonderful church that stands proudly on a spit of land overlooking the water. 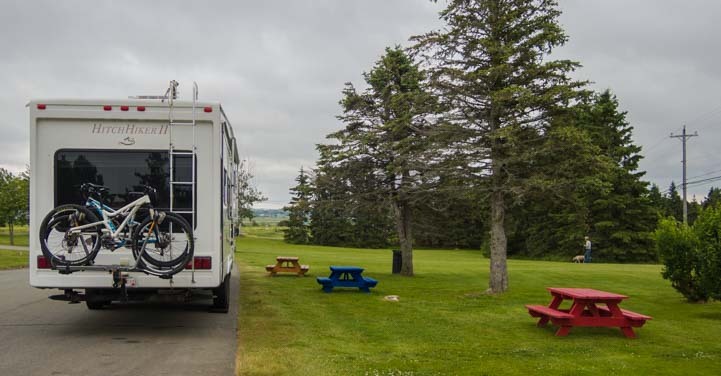 Nova Scotia is a big province that can be daunting to try to see in one short trip by RV. Which way to go and what to see?? Little scenic daytrips like this one were jewels in our travels there.